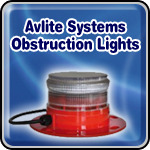 Avlite Systems Obstruction Lights - Avlite Systems is a technology leader in the design and development of solar-powered aviation lighting equipment. We employ leading engineers to create innovative products to service the needs of our customers worldwide. A key supplier of airfield lighting to defence departments around the world, our customers also include tower and crane operators, civil and regional airfields, and construction and mining companies.